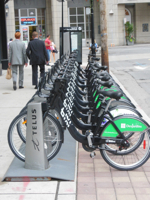 “2014-02-05: Engaging both new and seasoned cyclists of all ages, as well as those who want to bike but may not feel comfortable, is what the city centre cycle track network is all about, according to Ryan Murray, a spokesperson with the City of Calgary. “The cycle tracks we’re proposing, they’re really built for everyone. We’re not just looking for people who have a bike in their garage now,” he said. Against the call that property taxes cannot be increased, people are supporting increased taxation for transit. 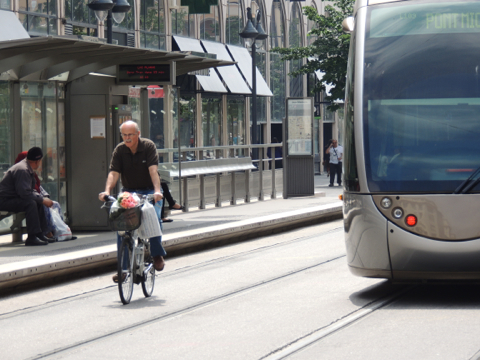 A principle: Growth of cycling as a mode of transportation is stimulated with quality transit services. 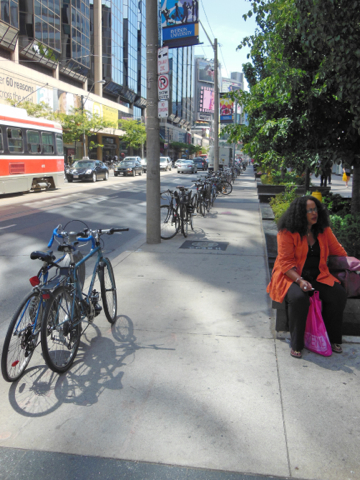 For people, cycling is an effective and appealing feeder mode to transit stops. For people, cycling extends trip distances and increases transit ridership when cyclists can take their bicycles on transit vehicles. Politicians are telling us that the level of property tax has hit the pinnacle. Politicians are telling us that property tax cannot be increased. Maybe the public, the taxpayers of the property tax, are telling us something else? 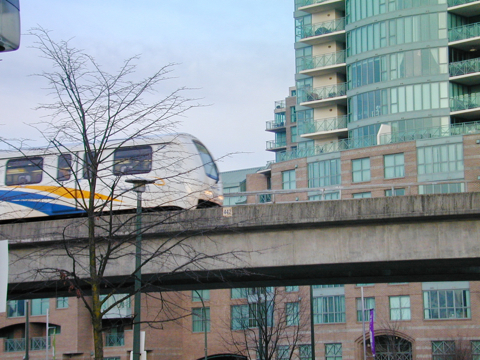 In a number of municipalities in North America, residents are supporting initiatives for more taxation for transit if the taxation is linked directly to improvements in transit availability. With their pocketbooks they are supporting transit levies of various forms. In a recently released document, again resident of a municipality are supporting greater availability of transit. This time, the question dealt with an increase in property taxes for that purpose. Only a small portion did not support any increase. 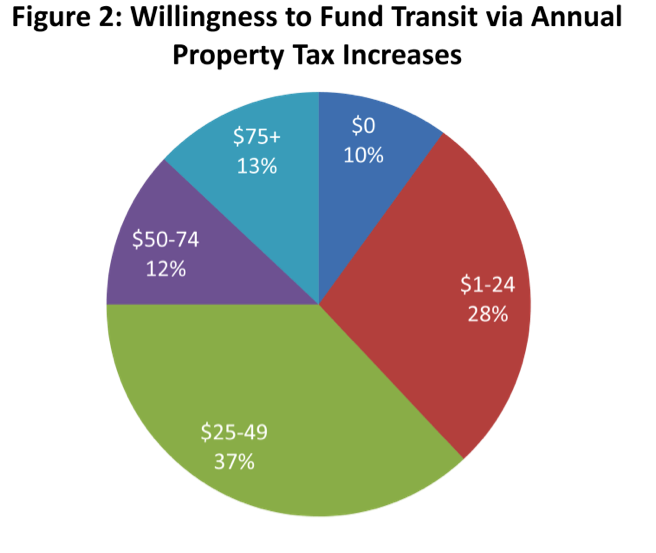 Half of the respondents supported an increase of $25 to $75. The Sunshine Coast Regional District is a region located on the northern side of Metro Vancouver with a population of 28,000 that swells in the summer months. The SCRD covers an area of 3.780 sq. km. Majority of survey respondents were willing to support an increase in taxes to implement increased transit service on the Sunshine Coast. The Transit Future Plan sets a transit mode share target of 5.4 percent for all trips by 2038, which will require the Sunshine Coast transit ridership to grow from 0.5 to 1.8 million trips per year. This target aligns with the Provincial Transit Plan’s transit mode share target for regional centres in British Columbia. It is all about increasing cycling traffic. For each obstacle or perceived obstacle that is removed from the thinking process of potential cyclists, the greater will be the penetration of the potential cycling market. The greater will be the daily cycling traffic. For some, the ordinary bicycle, no matter the design, will not do for reasons that may range from personal energy levels to personal preferences. E-bicycles reduce some of these obstacles for not cycling for part of the potential cycling market, the customers. 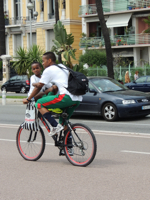 Type 1 – The type that have normal bicycle frames and have an electric motor and battery attached. 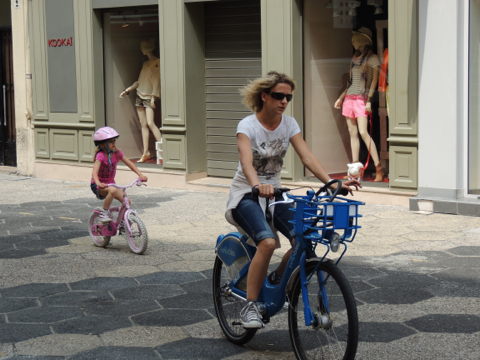 Type 2 – The type that looks like mopeds and have pedals, which qualifies them as e-bicycles providing the maximum speed does not exceed 32 kph in North America. Over the past few years, TransLink, the local transportation authority in Metro Vancouver, has been approached a few times for allowing the bicycle-framed type of electrical bicycles on transit vehicles. There has been too much tradition in building rapid transit lines as projects in themselves, without consideration for urban communities that will be services by this faster form of transportation. The billions of dollars invested in rapid transit lines are now in competition for ridership with the adjacent streets. There is nothing like governments creating competition with themselves, one form of transportation with another. It is all about building vibrant, liveable, sustainable, green communities where people can live healthily and happily. Clean transportation is one of the options to get there. If neighbouring communities do not benefit from rapid transit lines, then significant chances to move the liveable community agenda forward will be lost. If residents of local neighbourhoods do not see improvements that would benefit them, they may become vocal. There are principles, believes, and values that should be part of any political actions for approval of any new rapid transit line investments. If you wish to expand the size of any image, then click on the image. For promoting cycling touring, information on closed sections of interstate and state highways needs to be easily accessible on the Internet. Adventure Cycling maps do provide routes through the state and are useful, if you are going in the direction set out and if you have the time and energy for the defined routes. Realistically, the only provincial / state entity in North America that has comparable European style cyclotouring capacity, which appeals to families and children is the Province of Quebec with its famous La Route Verté network and the province’s capacity for combined mobility with the intercity transportation providers (trains, buses). California is a frustrating state to cycle in. Actually, there was enough frustration during the trip where I did not want to cycle to another city and just wanted to get out of the state. Discouraging was the number of occurrences where interstate and other highways were closed to cyclists along my desired route path. This did not happen in other western states. Yes, one could go way out of the desired direction to find highways to cycle on. Many times these highway routings were not direct to the desired target city for that night. It would have taken much longer to reach my final destination this way. 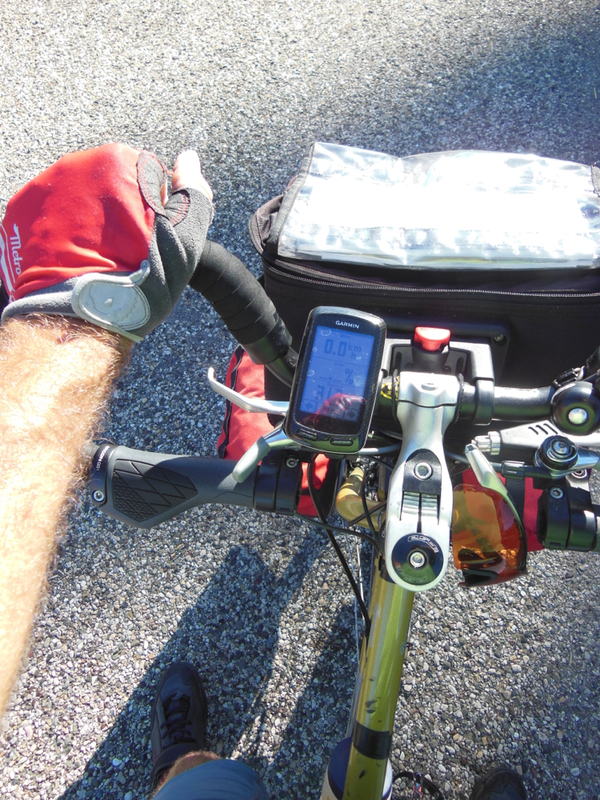 Replacing maps with GPS-based cycling computer. Trip planning for the next day, setting up the day course on my Garmin BaseCamp computer mapping software, and then downloading the information onto the Garmin 800 GPS took much longer than it did in other states. Sometimes it took an extra hour. The lack of readily availability of information on which section of interstate and state highways were closed to cyclists caused trip planning to be time consuming. The dreaded sign on interstate and state highways. Time to get off. The highway not designed for cycling as a mode of transportation. On one day, an unexpected cycling prohibited sign on a state highway forced rerouting and change of destination for the night half way through that day’s trip when uncancellable motel reservations were already made in another city 30 kilometres farther away. This happened on a Saturday of a busy weekend, which drew many tourists to this area. Hotels and motels were filled up. Finally, an accommodation was found late in the day at the edge of that city. As it turned out, it was the last room available in the motel. A bit of luck, at least. There was no advance warning signs that this would occur. There were no cycling bypass route or signs. The only alternative was to cycle 20 kilometres north and then another 20 kilometres west to meet up with a highway that would take me to my intended destination. Now, the question became “Is the highway to the motel open for cycling?” Not wanting to take that risk, the decision was to stay in the city with the prohibition sign and do a major reroute of the trip bypassing some places that I really wanted to cycle through. A few days later I was cycling on a state highway when that highway split into two highways. There was one of those cycling prohibited signs for the highway that I wanted to take. 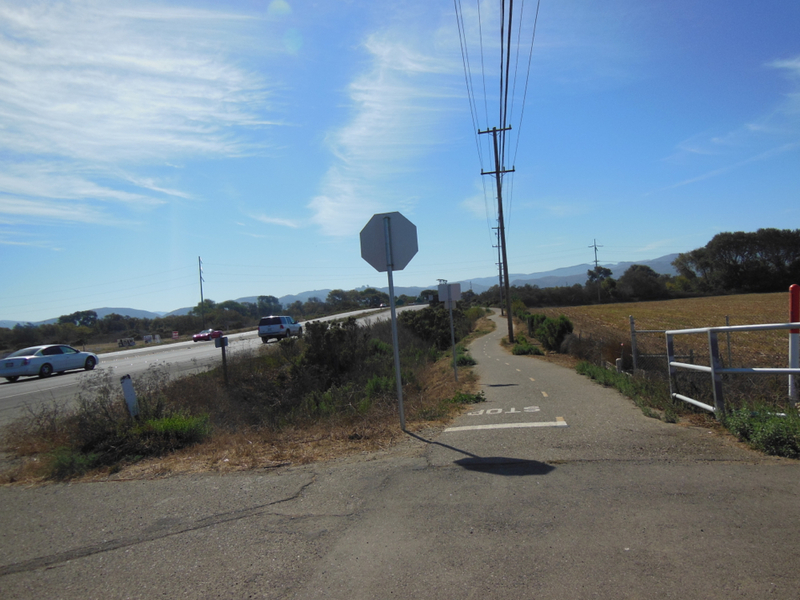 Joyfully, I noticed a bike route sign leading to the other highway. So I took it expecting that at some point I wild be directed back to the highway that I wanted to take. After an hour of cycling I realized that would not happen. Fortunately, a person at a service station could direct me back to the highway that I wanted to be on by using some local roads. Confidence was now lost that I could depend on highways to be open for cycling along my intended route. So, this is cycling in California! The Internet was a frustrating place to find the needed information. Maps to identify open roads for cycling did not seem to exist. There was conflicting and sometimes incorrect information on blogs. 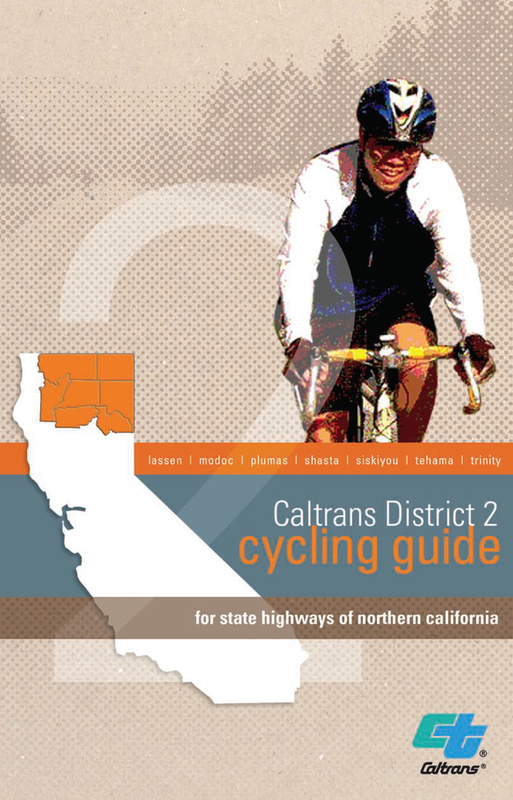 CDOT District 2 Cycling Guide providing information on interstate and state highways open and closed to cyclists. There was an exception and that was District 2 of the Californian Department of Transportation, a northern district. This district had produced a very effective and informative document for cycling there (http://www.dot.ca.gov/dist2/pdf/bikeguide.pdf). Open and closed highways to cyclists were identified on maps. For closed sections, alternate routings were mapped out. Other useful information was provided. Internet search did not reveal the existence of such a document for the other districts in California. It certainly is needed. Bike Routes Parallel to Highways. Sometimes by chance, parallel bike trails were come upon through Internet searches, by chance, or avoiding restricted sections of highways. Some of these trails were well marked with direction and destination signs. Others were not. Sometimes these routes used local and rural roads. 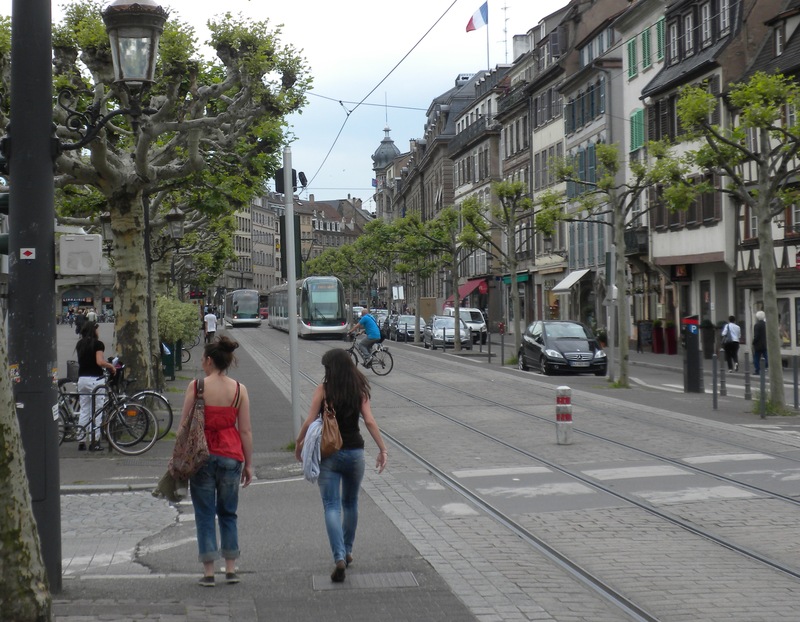 Some sections would have bike lanes and paved cycleable shoulders. Some of the roads were shared roads, usually with a low amount of motorized traffic. 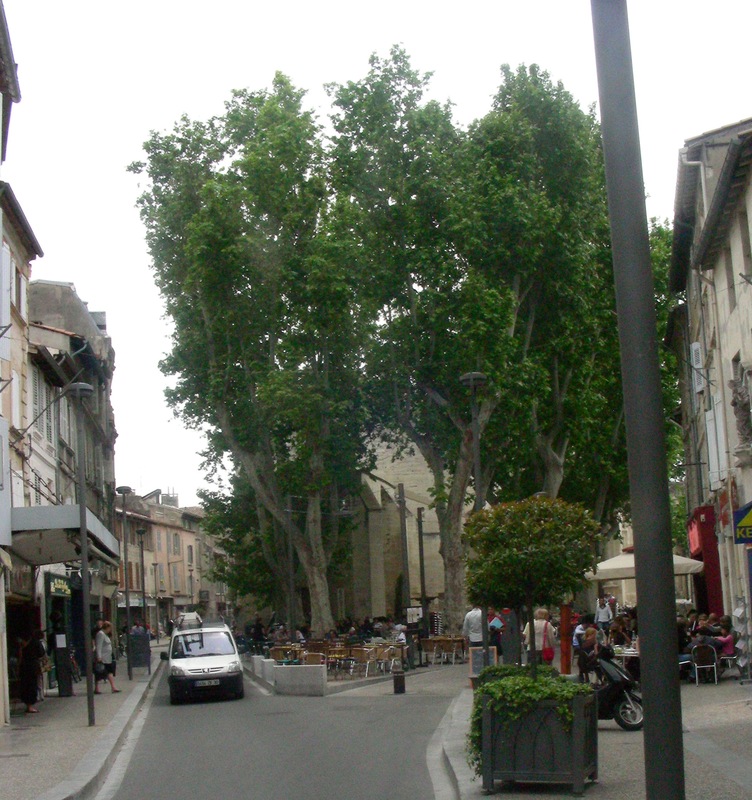 For the most part, bike lanes or cycleable paved shoulders were available on these roads. 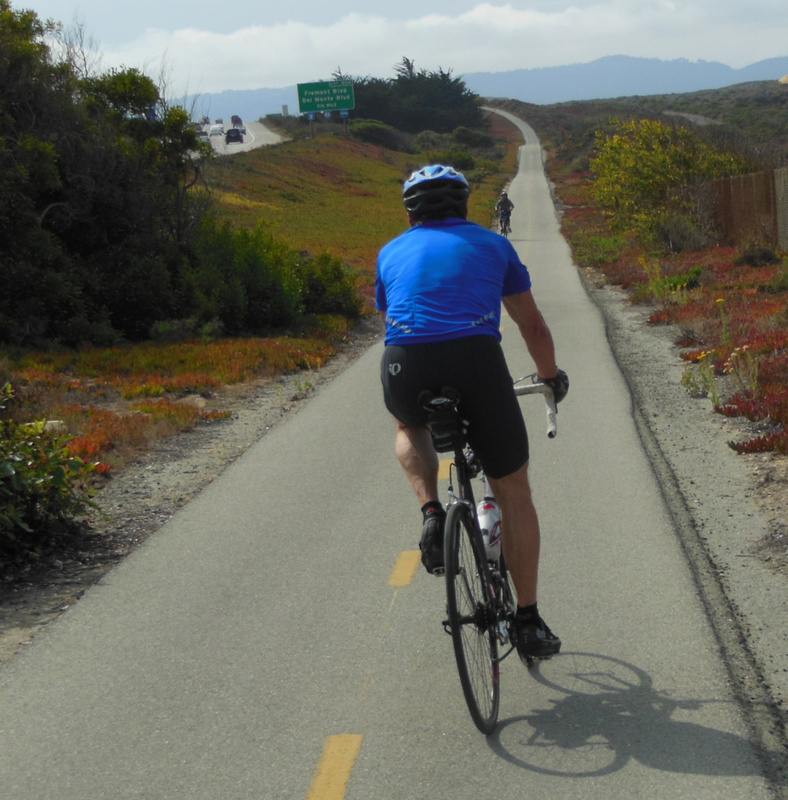 Pacific Coast Bike Trail between Santa Cruz and Monterey CA. 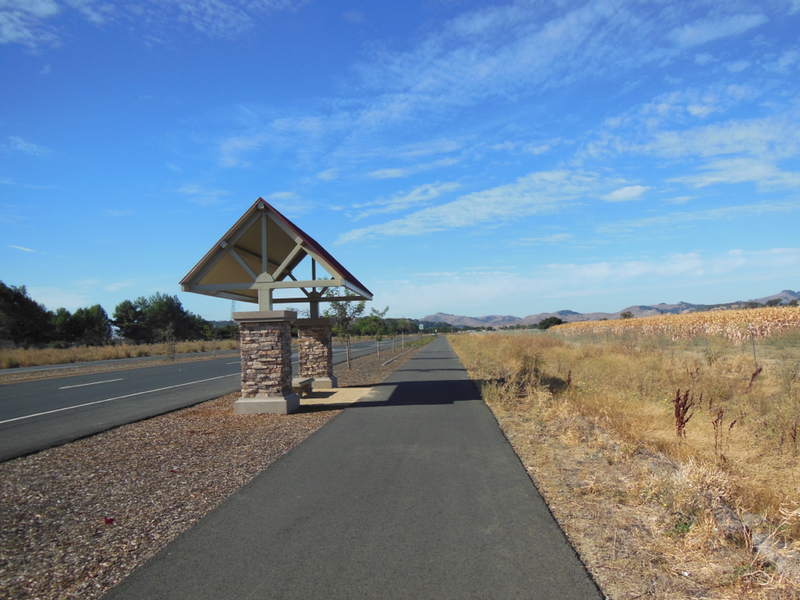 The well signed trail travels along county roads with sections of bike lanes, paved cycleable shoulders, and trails. Bike paths next to a highway were frequently encountered as an entry to cities, while some started before city limits, up to 20 and 30 kilometres. 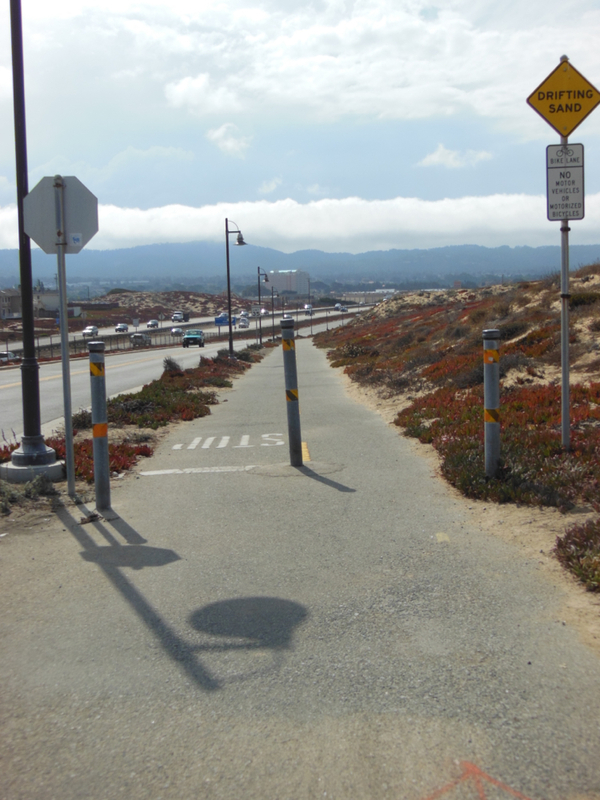 Some examples included Monterey with a path starting 30 kilometres before the city limit and Santa Cruz with a bike path starting at city limit. As some municipalities are approached, the adventure of entering is much more comfortable as bike trails branch of state highways. For some municipalities, the experience of leaving is also enhanced with bike trails. As some municipalities are approached, the adventure of entering is much more comfortable with bike trails branching off state highways. For some municipalities, the experience of leaving is also enhanced with bike trails. 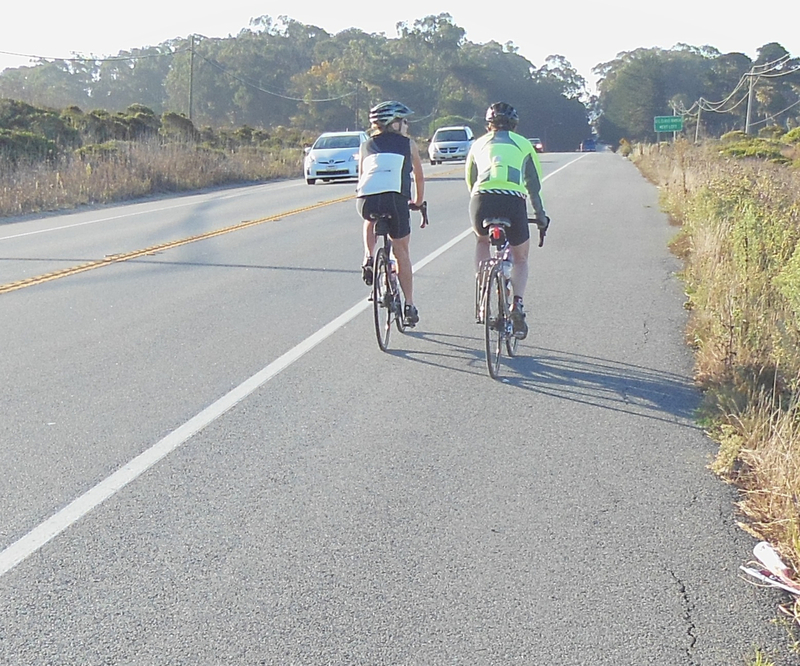 As mentioned in a previous blog, the positive effects can be continuously seen while cycling in California of federal road programs which requires cycling facilities as part of the funding for new and rebuilt roads. One continuously comes on these facilities in municipalities from the smallest to larger cities as well as on rural roads from county roads to state highways. It is rare to cycle in any municipality that is without any bike lanes or trails. 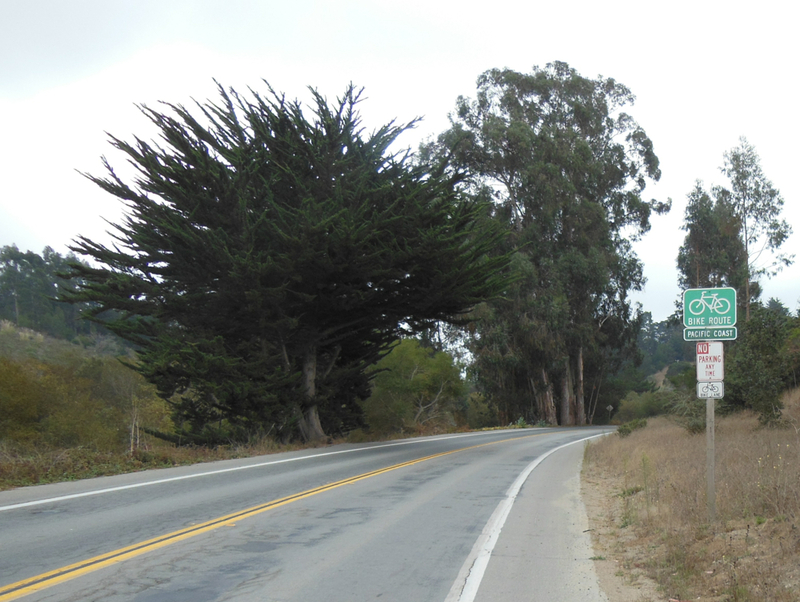 Rural California, cycling made more pleasant with bike lanes or cycle able paved shoulders. Cycling cities. Separated bike lanes in downtown waterfront area supporting retail. When discussion turns to cycling cities in the US, normally Portland, as a US large cycling city leader, Seattle (3.5%), and San Francisco (3.5%) as an upcoming cycling city, are mentioned. Sometimes the City of Davis is mentioned with its 22% cycling mode share. There the discussion tends to end. On this trip there were other medium size cities that should be recognized for their work towards building of a cycling network and for developing a sizeable cycling mode share. 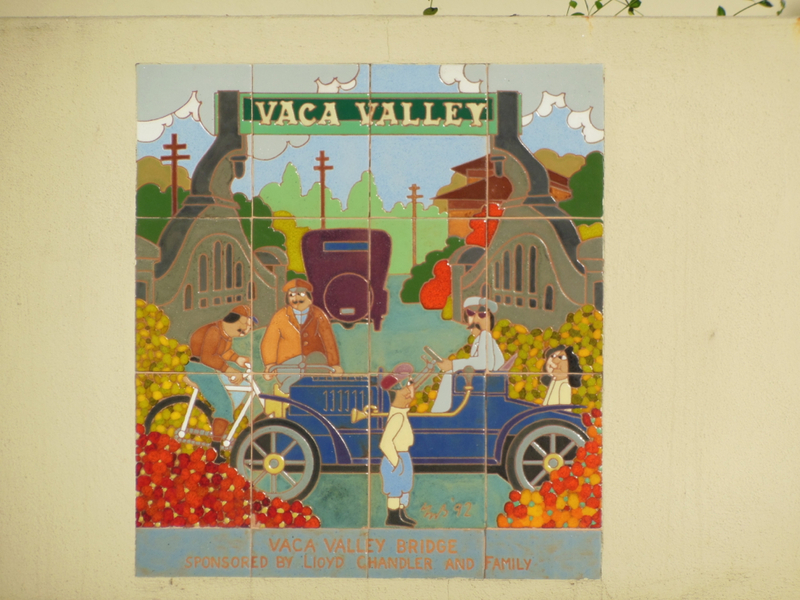 Municipalities passed through that have made an effort towards providing cycling facilities include Fairfield (0.2%), Vallejo (0.2%), Monterey, Avila Beach, and Santa Maria (0.5%). Special mention goes to the efforts put out by the following cities: Santa Cruz (cycling mode share 9%, many innovative cycling features), San Luis Obispo (7%), and Santa Barbara (6.4%). Cycling cities. Separated bike lanes making the commute more pleasant. Cycling cities. Downtown bike parking on streets. 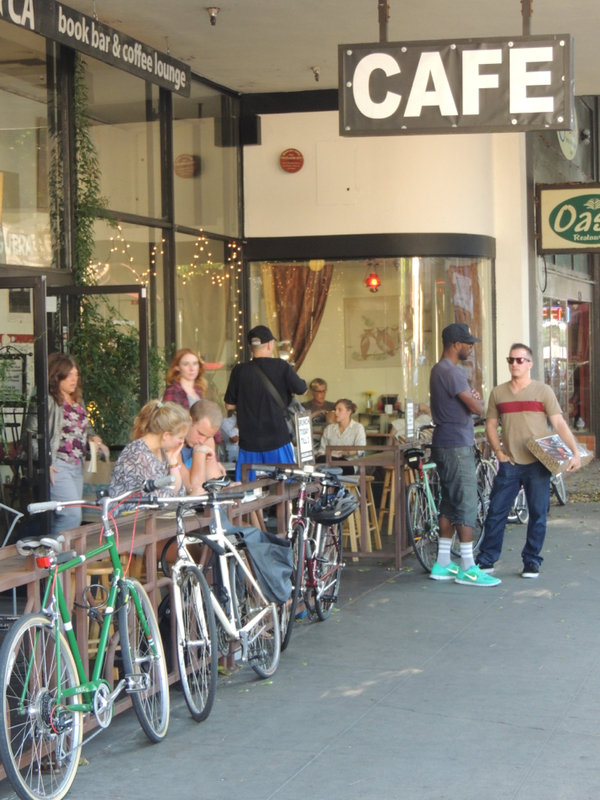 Cyclists are good customers for retailers. Cycling cities. 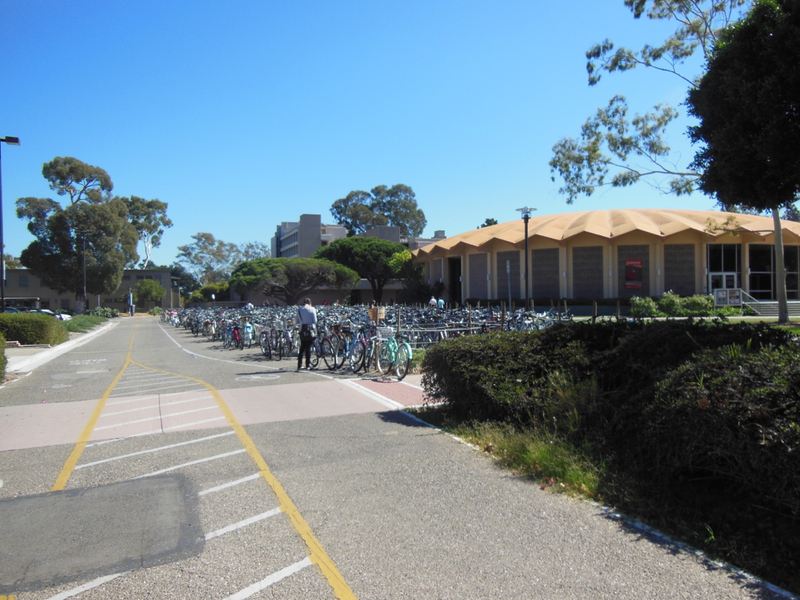 Mass bicycle parking contributing to attainability of higher education. An indicator of the attraction of cycling for transportation when the environment is supportive. Cycling cities. 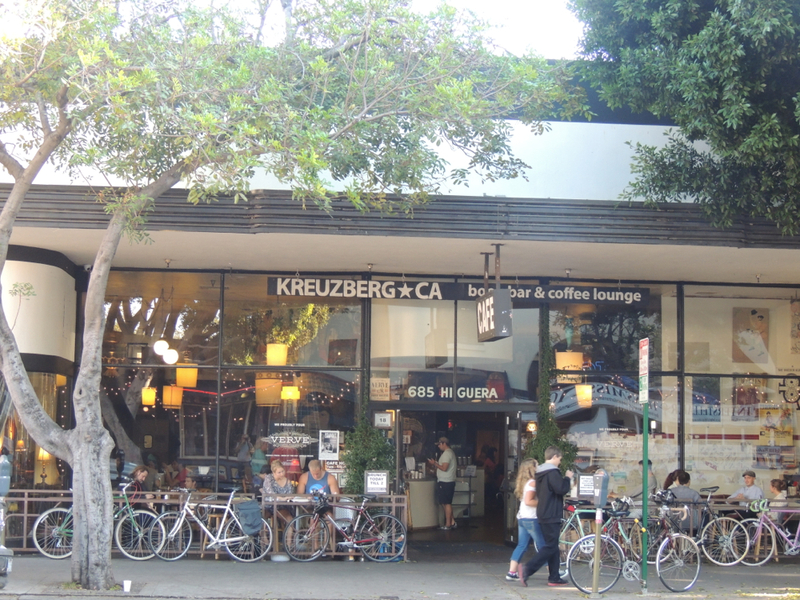 Cyclists are good customers for retailers. Source of cycling mode share to work: League of American Cyclists, 2010 data on bicycle commute mode share (based on the US Census American Community Survey with data on 375 cities over 60,000 population). The City of Vancouver’s draft Transportation Plan 2040 contains some interesting strategic directions which will further the use of Active Transportation modes of travel while decreasing the dependency on car use. Now, if one steps away from the details of the plan and views the document from a macro point of view, then the plan feels like an incremental step forward from the past rather than a dramatic change in the way we travel in the next 30 years. At this point in time, a dramatic change in travel is what we need, not crawling forward at past speeds. Why is a dramatic change in the way we travel now needed? Well, all the rational has well been debated from the desire of the residents of Vancouver for improved air and noise quality, personal health issues, growth of obesity and the contribution to that from modes of travel, health care cost, and so on. The Draft Transportation Plan feels like a technical document, not a change agent paper. There is a lack of a new vision in the document for transportation and for transportation’s role in creating a liveable, green, sustainable city community which has vitality and spirit that people can see, feel, buy into, and get inspired by. There is a lack of connectivity of this draft document to the vision of the city and its key strategies that will make this plan’s contribution to move the city towards realizing that vision. In addition to focusing on directions for growing each mode of transportation, some strategies should concentrate on people and persuading them to make modal shifts to active transportation options. One could argue that a strategy focusing on people and inducing mode shift could be the key strategy for a transportation plan. In this article, the phrase “active transportation” includes walking, cycling, transit, and other modes that travel at the speed of walking or cycling (wheelchairs, skateboarding, in-line skating, etc.). The Transportation Plan 2040 and its recommended infrastructure, toolkits, services, and programs shall be focused on social marketing of the preferred modes of transportation, be focused on reaching the plan’s target transportation mode shares, be contributing to reaching the stated city direction to be the greenest city in the world, meet the Kyoto commitment, and be a contributor to achieving a true green, sustainable, and vibrant city. The implementation of the plan, including infrastructure, its design, and programs, shall focus on a target market and the customers of that market who need to be induced by alternate transportation modes to meet the city’s vision of a sustainable city and a world leader. For modal conversion to occur, motorists will need to have alternate forms of transportation available and to their liking for the Transportation Plan 2040 to be successful. For growing suburbs and non-central core densification, it is highly desirable for active transportation options to be in place before decisions for home purchase are made. Does one buy a car and a home or does one decide to use active transportation and have more money that normally would go to car driving and ownership be available for home purchase? 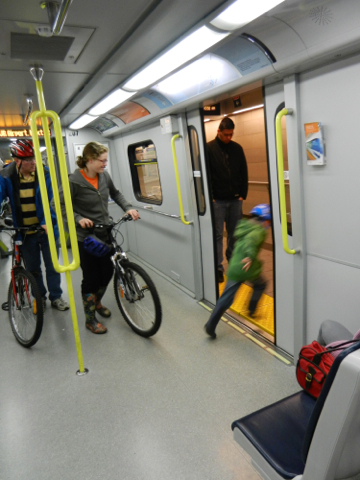 That is the choice for home purchasers when active transportation options are in place. When not, what choice is there but to commute by car? With a population expansion within any parts of a city, there is criticism of congestion. The first choice option for congestion relieve for cities is to put in more road capacity. As we know, road capacity expansion will only provide short-term congestion relieve. If the city wants to be truly a green city, then it makes good sense to put active transportation measures in place, determine its impact on road congestion, consider if the level of road congestion is desirable to support use of active transportation, and then decide if road expansion is really necessary. Active Transportation alternatives will be implemented and in operation for a minimum two years in any corridor before any assessment is made for increasing road capacity for cars and trucks, from simple improvements such as left or right turn lanes to additional lane capacity. Save for lack of personal financial resources, people will not make modal changes unless the alternative makes sense to them, fits in their lifestyles, are socially acceptable, does not impose an unreasonable discomfort, and the facilities are to their personal liking. So, it makes sense to choose and focus on a target market and its customers and design for them very specifically, rather than follow some design manuals. Target marketing versus the shotgun marketing approach to design of infrastructure facilities and cycling network should result in significant cycling traffic growth. Designs shall meet the needs of people from the young to the seniors (8-to-80 or AAA concepts) and shall be specifically focused on the needs of the target market of customers (i.e. motorists that are open to change in transportation modes) that will need to be induced to use active transportation alternatives for the targets for transportation mode shares to be achieved. Real growth of active transportation will be enhanced through change-inducing statements from traditional practices, rather than incremental enhancements of past practices. Bold, clear statements that signal rapid change will result in creative solutions that residents of the city will see as explicit signals that modal change needs to happen and that they need to play an active part in making it happen. 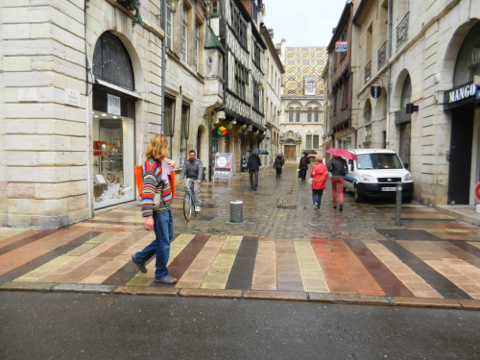 Strategic Direction for Walking – Direction should include a statement that the walking infrastructure and its support facilities (audible signals, signage, wayfinding, etc.) shall meet the needs of both the young and the seniors, who may have visual, balance, navigational, motor skills or other limitations. Strategic Direction for Cycling – Market segmentation shall identify the characteristics of potential cycling customers. Infrastructure design and social marketing programs shall focus on the needs of the target market segments and induce them to use cycling as part of their transportation options. 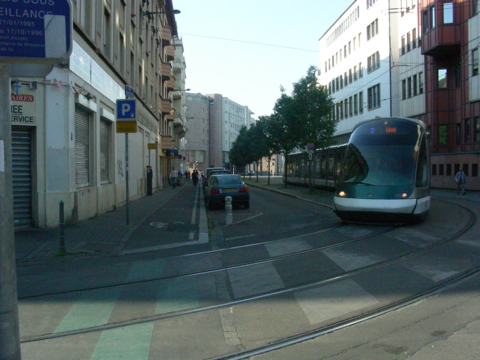 Streetscape – Two-way tram line on sunny side of retail street. 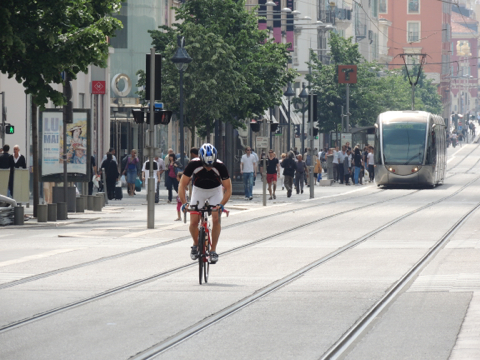 Cyclists and trams co-exist. Nice Fr. Strategic Direction for Transit – Work towards an effective transit system with service levels that will attract people away from using their cars. Work towards a city being served by a full complement of transit layers, including streetcars / trams, maximizing the appeal of transit to the public. Work towards maximizing the transit ridership growth opportunity through combined mobility strategies, infrastructure, and social marketing programs (transit and cycling). Improve the quality of the air in the city and control of noise pollution with a 100% electric-powered bus and commuter train system. Strategic Direction for Motor Vehicles – The city shall remove itself from a non-essential city service of providing on-road and off-road car parking and reduce its road maintenance costs in the process, considering that there is private sector capability to provide such services from land owners, developers, residential complexes, private home owners and potential new entrants such as car parking condos for neighbourhoods. City shall separate the sale of parking spaces in residential and commercial buildings from the sale of home and office units. The city shall support such a separation by applying and invoicing municipal taxes separately for homes and offices and for car parking spaces. City shall implement bylaws, which allows unused car parking spaces in residential and commercial buildings to be rented out for short-term parking and potentially long-term parking if short-term parking demand has been satisfied. Strategic Direction for Land Use – Integrate transportation planning with land use, urban planning, urban form, and zoning bylaws through zoning densification levels in each neighbourhood along all corridors generating sufficient traffic for quality active transportation modes thus allowing active transportation facilities and services to be implemented on an economic case basis. 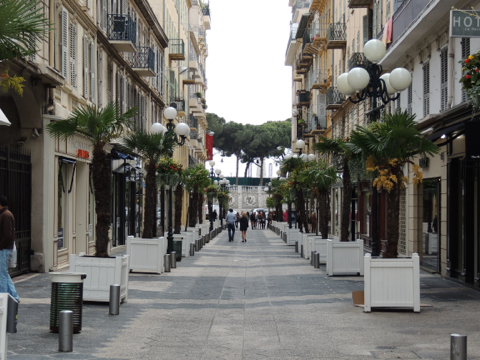 Streetscape – A shopping people street; Nice Fr. 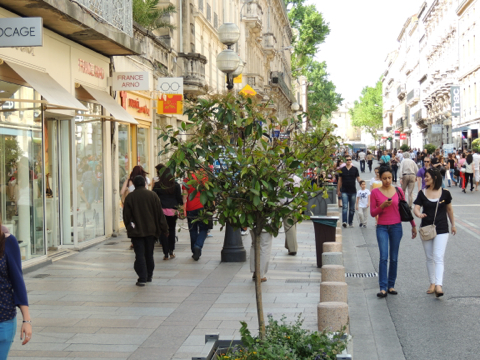 Strategic Direction for Streetscape – The Transportation Plan should include a vision and strategy for people streets where car and truck access is managed and controlled to time of day for delivery of goods, municipal and emergency street services, transit, and local residents. The opening statement should include “and support significant cycling traffic growth by inducing people not to drive and use cycling or combined mobility of cycling and transit instead”. Want significant cycling traffic and use growth? Want continued snail-pace, incremental growth for the future? The first policy should address a rapid implementation (5 year) of a high-quality cycling network, city-wide, to determine the amount of modal conversion from driving that can be achieved and to allow for wiser investment in road infrastructure for car traffic in the future. The second policy should address the focus of infrastructure, network, infrastructure toolkit, network toolkit, and social marketing that would appeal to motorists to cycle instead, including combined mobility. 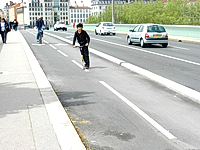 The third policy should call for quality, physical separation of cyclists and motorists (with barriers, not paint, thus preventing cars and trucks from using cycling facilities) that would induce motorists to cycle instead. The fourth policy should address the role of public bike sharing system in advancing cycling and cycling-transit usage. The role should be directed to expansion of public bike sharing systems beyond the current model and usage. The network policy should call for feeder networks from home to schools, transit facilities, shopping areas, and other destinations. Provide suburban neighbourhoods the feeling of cycling that one gets when cycling along a seaside bike trail or on abandoned or operational railway lines. 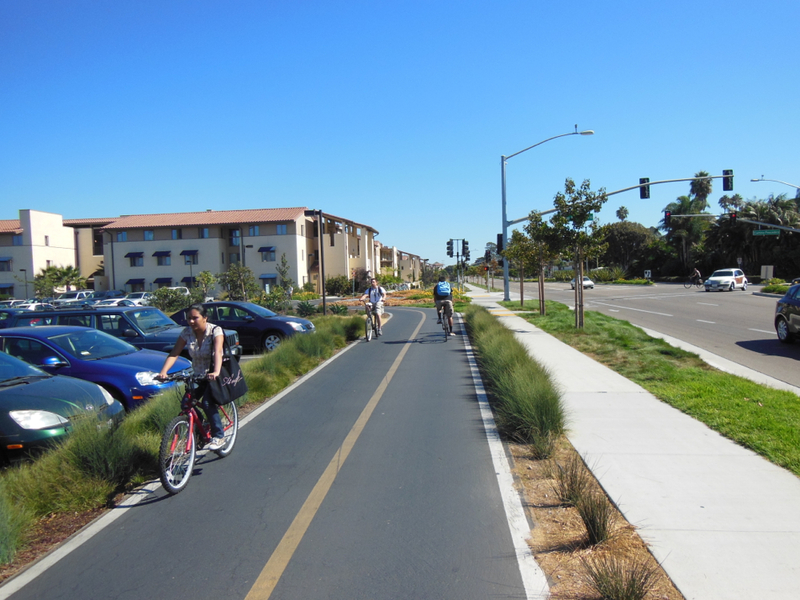 This policy should also include providing seaside path type of facilities on interior local roadways, separated cycling facilities along retail streets, and separated cycling facilities along any roads adjacent to rapid transit lines (existing and new). In general, the policy statements in the Transportation Plan 2040 document are very lightweight, not exemplary of a pacesetter city, and more indicative of a follower city content to be positioned behind American cities with little cycling enthusiasm. Each municipality needs to make a decision. If that decision is to move towards Active Transportation and away from cars as the primary forms of transportation, then bold, visionary, leadership statements and strategic directions are needed. As they say – no pain, no gain. If no gain, then pain as personal health care issues continue to climb quickly, along with the tax burden that each person carries for maintenance of the health care system. 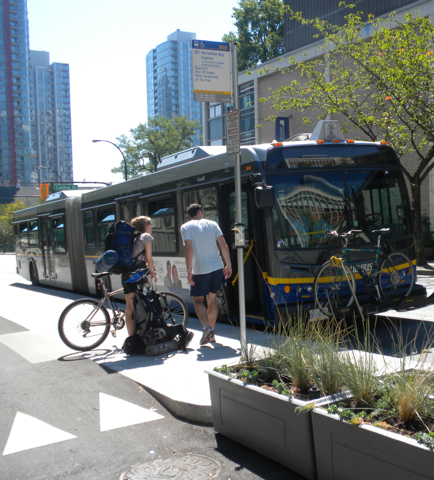 The City of Vancouver has released an initial draft of its Transportation 2040 Plan for public consideration. 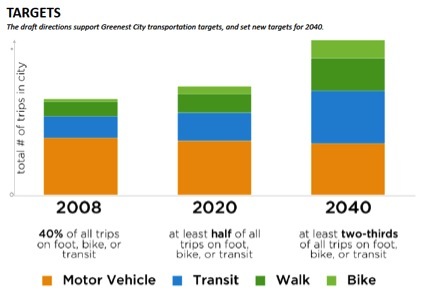 Within the plan, the city spells out its transportation mode priority for the next 30 years and its target mode share. At the recent Velo-city Global 2012 Conference on cycling, international experts called the city’s cycling component of the plan and its target as too slow and not enough. Experts from around the world sensed that the next growth in cycling and attracting motorists to use cycling for transportation will come from physically separated bike lanes and from combined mobility trips of cycling and transit. 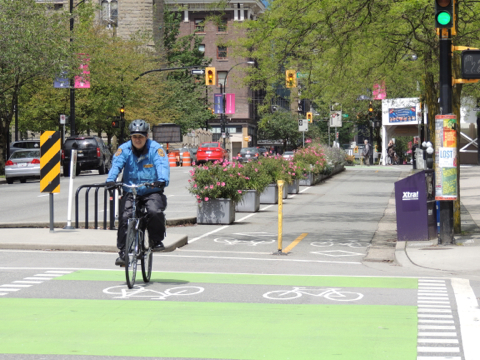 Cycling growth in the City of Vancouver has been very slow. From 1991, the mode share has climbed from 1.3% to 3.8% or 0.114% per year while Copenhagen has increased cycling by 4% in two years and Seville has increased it by 4.5% in 5 years. The City is proposing that the target cycling mode share for the next 30 years should show growth of 3.2% from the current 3.8% level to 7%. With this target the growth rate will continue to remain slow at 0.11% per year. This growth rate is certainly not at a pace of a world-class green city. This growth is more like that of a follower city. One Transportation Planning Manager was trying to placate an audience at a consultation session by stating that the City normally reaches targets very early in its transportation plans lifecycle. Well, the question may be asked to the value of a target if it can be easily met rather than be challenging for city staff and the public and also be a signal of change in how we travel. The city wants to be the greenest city in the world and has committed to achieving the Kyoto protocol calling for reduction in greenhouse gases to 6% less than the 1990 level. Basically, the Kyoto commitment means that all trips originating from population growth must be by active transportation modes, not by car. Future cycling growth will need to come from those who drive today. The easy growth has been realized. Now is the time to shift into social marketing of cycling. Social marketing will not be effective unless a robust and highly desirable cycling infrastructure is in place. With the city’s desires and with the strong commitment from the public to the greenest city and Kyoto goals, it might be appropriate to adopt more challenging transportation mode share. An aggressive set of transportation mode share targets will contribute towards this city to becoming a world-class green city, reducing air and noise pollution, helping improve individual health, and reducing the associated health care costs. Guided by the City’s gains in reduction of car trips within the downtown core and accomplishments of other cities in reducing driving and increasing cycling, consideration should be given to adopting aggressive targets for the 2040 transportation mode shares. Transportation mode share is usually defined by driving, transit, walking, cycling, and by others. For more effective direction of future efforts, a more detailed set of targets may be appropriate. Also, the current set of targets understates the use of each mode, as combined trips are not accounted fully in the statistics. With this set of mode share targets, cycling would be involved in 35% of all trips, transit in 30%, and car trips in 32%. With aggressive targets, staff has clear direction on strategies and speed of implementation for realizing the next transportation plan. Some comments on the City of Vancouver’s initial draft of its Transportation 2040 Plan will be published on August 26, 2012. 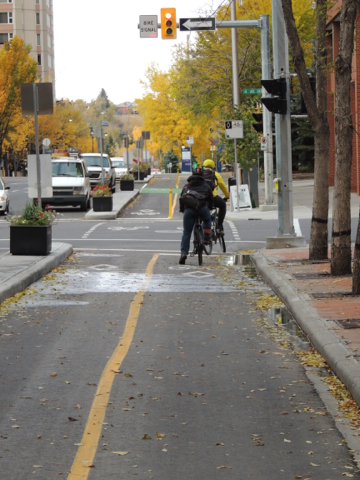 A recent radio interview highlighted the timeliness for Calgarians to have a comprehensive dialogue on separated bike lanes (SBL), especially local cycling advocates and those interested in better cycling facilities. The dialogue should start with the question of why have SBL and then continue into concepts and designs, fit into local streetscape and urban form. Then the dialogue must include how SBL contributes to local business and to the city as a whole. Separated bike lanes have been shown to be successful in instigating a shift from driving to cycling. It is a tool that comes in many configurations of designs and fit into local urban form. The type chosen has a direct impact on the degree of local acceptance and of success in increasing cycling. 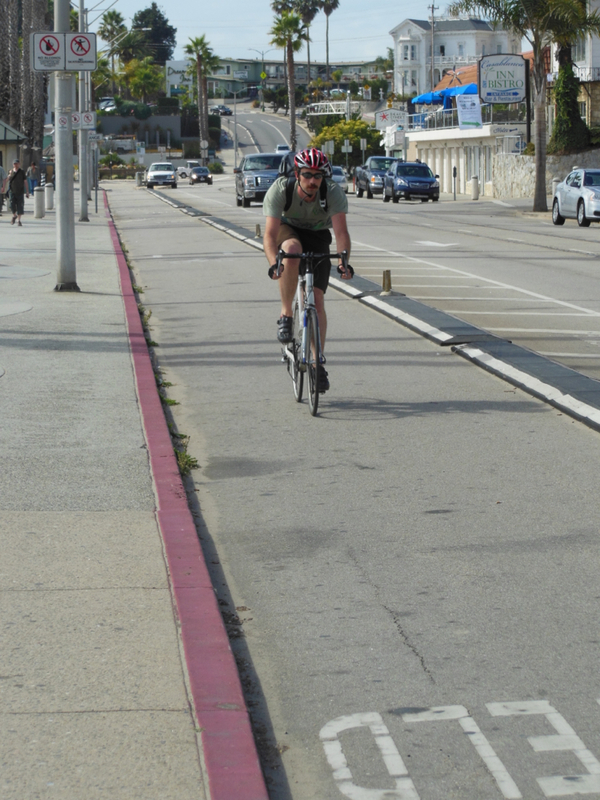 How wide should the separated bike lanes be? Well, first it should be established what the objectives for the SBL should be. Is it for the convenience of current cyclists? Is it to provide capacity to meet natural cycling traffic growth or the city’s future cycling mode share targets? Is it part of a city reshaping itself into a large city or world-class city form, instead of a sprawling metropolis? What current barriers are hindering cycling growth that could be accommodated with SBL? What human characteristic could be designed into SBL to cause significant growth? Acceptance of SBL is greater by cyclists and by potential cyclists if they could see efficient trip time. One of the factors, capacity to pass slower cyclists, is key. The next big step into cycling growth is to move away from solitary cycling to accommodating social cycling of two people side-by-side deep into discussion. Intersection passage time is also key. 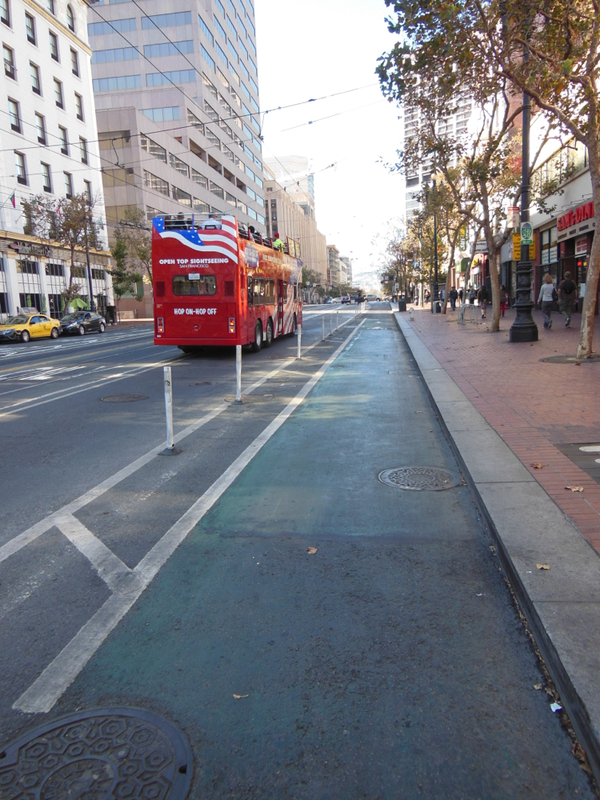 Generally, separated bike lanes comes in various forms of separation from vertical to horizontal, at general traffic lane level, on sidewalk elevation, outside of road right-of-ways, etc. 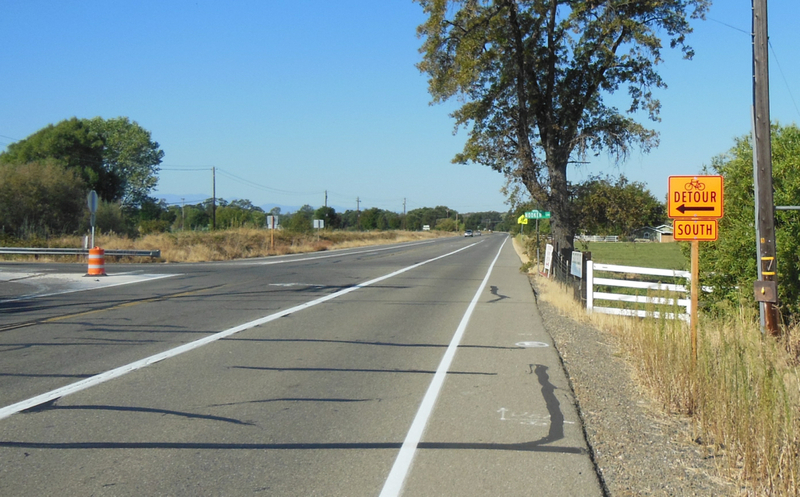 Separation comes in many forms from virtual where drivers’ observance of painted lines provides the separation to physical through various forms of barriers that will have negative effect on cars if drivers were not to observe the barriers. Physical separation can be provided at various cost levels from minimal to sophisticated separation designs that fits well into urban and streetscape forms. 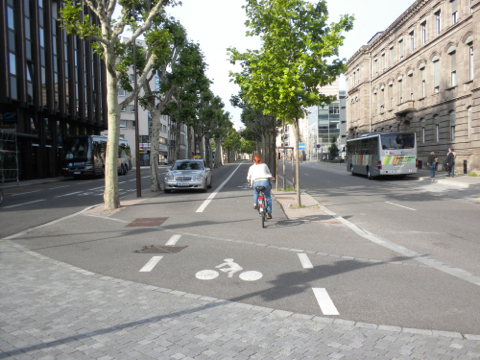 Observations of various forms of SBL in cities within Europe and North America indicate the need for physical separation where cars, trucks, and motorcycles are prevented from entering into bike lanes. 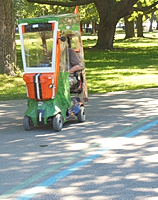 With virtual separation (painted lines or buffers) and half curb height separation (Copenhagen style), it is only driver decency that causes the bike lanes not to be used for passing motorized vehicles stopped for a turn, overtaken a slower vehicle, or parking, especially by delivery vehicles. Even car entry into bike lanes needs to be prevented for such bike lanes not to become parking lanes. However, the form of separation should allow police and other emergency vehicles to use the lanes to efficiently get by street traffic. 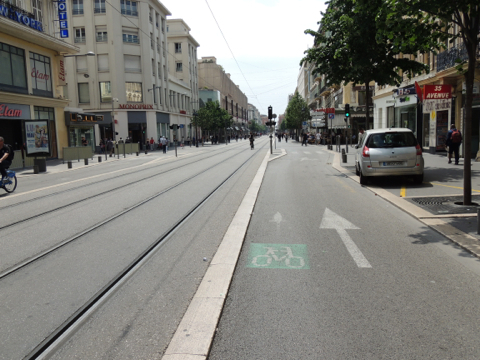 This also tends to encourage width of bike lanes to accommodate a police vehicle and a cyclist. A dialogue on this subject usually gets around to selection of one-way separated bike lanes on the same or adjacent streets to the use of two-way bike lanes. 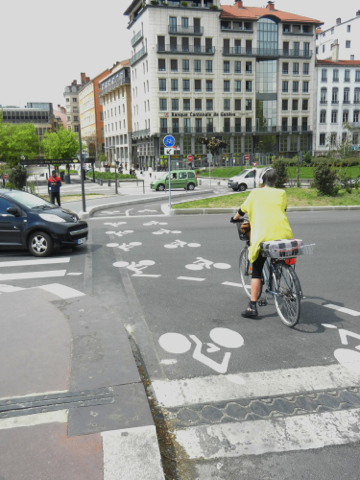 There are many arguments that can be made for either solution that would better fit the needs of cyclists, motorists on the streets, local businesses, and urban and streetscape form. Two-way separated bike lanes are self-levellers of traffic accommodating cycling traffic jams and supporting social cycling. Bringing together into one space cyclists going both ways, the presence of cyclists on the road is much more evident to motorists, a bit of a marketing tool. Motorists will see the lanes actually being used and become more aware that their driving style needs to adjust accordingly. Another important benefit is the reduction of potential cross traffic of cyclists and motorists, limiting that to one side of a street. Should two one-way bike lanes be located on one road, no matter if one of the lanes is contraflow or be placed on two neighbouring roads? Location of two-way bike lanes should recognize night cycling and the effect of car headlights shining into cyclists’ eyes with overhead lights often being too weak in intensity to overcome cyclists’ blindness or blocked out by tree leaves making sidewalk curbs or separation barriers difficult to be seen by cyclists. Two-way bike lanes should be positioned on the roadway with direction of flow of cyclists and adjacent car traffic being in the same direction. This will place contra-flow cyclists horizontally farther away from the headlights of cars moving in the opposite direction lessening light impact on cyclists. 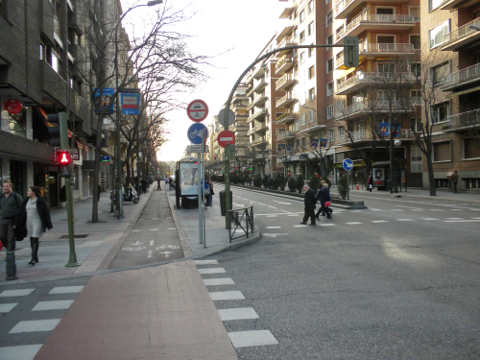 The dialogue should include such factors of one side of the street to the other as to the number of ingresses and egresses from local properties, the volume of cars turning across the two-way bike lanes, visibility of cyclists to motorists who are making turns across the bike lanes (left side visibility of motorists of parallel cyclists versus right side), and visibility of oncoming cyclists to motorists at intersections. Networking of cycling facilities is a cycling traffic growth factor. A cycling facility leading to on-street, shared cycling will only draw a smaller portion of motorists who could be induced to cycling if the cycling facilities were to their liking. The dialogue for downtown Calgary should include the priority of SBL extending a limited cycling capacity Peace Bridge facility into the downtown core along 6th or 7th St or both. The dialogue should also consider an option of SBL extension into the working core of downtown Calgary within the catchment area of cycling facilities to cyclists’ work places. SBL’s along these two streets would have limited value unless the SBL were continued and networked into the downtown core and underneath the railway tracks to the shopping areas of 10th to 12th Ave and to 17th Ave. Considering the cycling unfriendly 5th St and 8th St underpasses for potential cyclists and also cycling infrastructure catchment area, 7th St may be a more desirable street for an SBL as a first level network infrastructure. Some grey research that I have been doing over the last 10 plus years and supported by lower-level rigour research by others would indicate that catchment area of cycling facilities tends to be from 0 metres to 500 metres (5 blocks, 2 minutes cycling). For downtown city centrum, a catchment area of 2 blocks each side of cycling facilities is a highly desirable, first level networking design with catchment area eventually being decreased to two blocks between cycling facilities as the second level and then adjacent major streets as a third level. From a networking perspective, any off-road bike trails such as that along the Bow River should also have on-road bypasses as cycling traffic will built up on bike trails that will cause commuter cyclists to want to use on-road facilities from a commuting time perspective. This factor would encourage an on-road cycling facility parallel to the Bow Trail. Considering cycling infrastructure catchment area, the location of the Bow Trail, and the concentration of downtown workplace, a two-way SBL should be provided on 6th Ave as a first priority or alternately 5th Ave connecting with the Bow Trail via 11th St in the west and 6th Ave through the East Village at the east end. 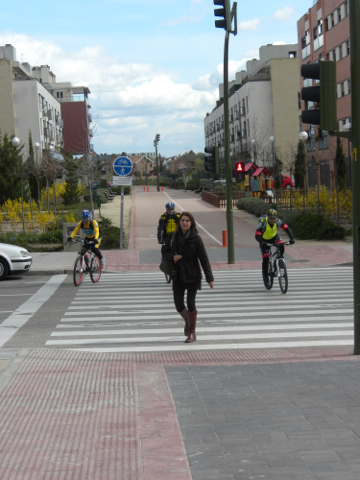 The dialogue should include discussion on intersection design especially motorists’ capability for turns across SBL. A through understanding on current motorists turning pattern needs to be had on candidate streets and alternate routing options for motorists should full or partial banning of turns occur across SBL. Cyclists trip time, cyclist’s’ visibility, and perceived safety for potential cyclists are driving forces for intersection limitations for motorists. Especially full prohibition or alternately no turn on red signal phase will enhance the perceived safety of SBL for potential and current cyclists. Alternately to full or partial turning for motorists at intersections, a cyclists advanced signal phase to clear backed-up cyclists at a traffic signal first before car movement starts will enhance the cyclists’ experience and the attractiveness to potential cyclists. The dialogue should also consider how to efficiently move cyclists with high visibility to motorists from SBL to intersecting streets and also bringing cyclists from these intersecting streets to the SBL. Coloured bike boxes (especially environmental green colour) at intersections of streets with SBL and diagonal streets is a good solution. At some streets up to 4-coloured bike boxes may be desirable. The dialogue should also include housekeeping and maintenance of SBL’s. What type of equipment should be added to the city’s arsenal and what cleaning frequency should be built into the city’s budget and maintenance procedures? Wind tends to move dirt and garbagy materials left behind by cars and especially trucks into SBL. Water ponding on SBL’s can be a significant problem for cyclists especially during freeze-thaw periods. Maintenance procedures should be providing quality of cycling service that reduces the chances of tire flats for cyclist and provides for safe operation of bicycles at any speed. 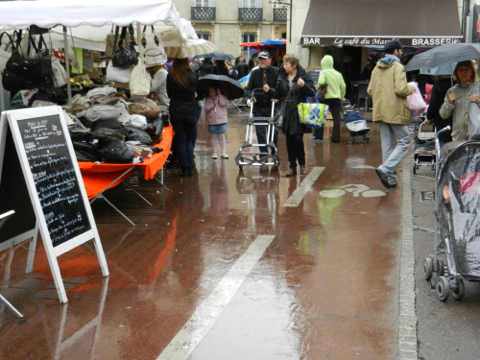 With a SBL network the desirability of cycling during rainy weather and winter increases significantly. While initially SBL were convenient places to dump road snow, slowly these SBL’s are now being maintained throughout the winter in some cities with much more snow than Calgary and heavier snow to move with a bicycle. In Copenhagen, the cycling facilities are cleared of snow before road lanes. As we know now in Calgary, snow clearance on the river bike trails starts early in the morning. Ice removal from SBL before morning commuting cycling starts is critical for making SBL desirable to potential winter cyclists. Reduction of cyclists’ injury and associated health care costs results from such a program. Road snow removal procedures will need to change. Today, the procedures usually call for two or more passes with the first pushing the snow to the curb or also on the pedestrian walking facilities and then followed by a number of trucks and loading equipment to carry away the snow. One-pass snow removal would make winter walking in Calgary much more pleasant and safer, especially for seniors and those with disabilities. One-pass snow removal procedures are in place in many cities and may safe time, cost, and greenhouse pollution production from snow clearing trucks for Calgary. The discussion contribution should be focused on a dialogued on SBL being a tool for shifting the appeal of downtown Calgary streets from places to avoid to people streets that attract Calgarians to spend time after 4:30 pm when the streets now become very deserted. Various forms of separation designs can enhance the visual appeal of downtown streets and softening the austere look of 1960 designs of car-moving streets. 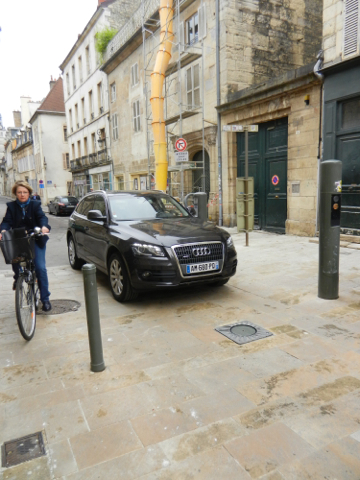 Street functionality can be enhanced with restricted-time, commercial drop-off zones, although neighbouring buildings should really provide that. Bus loading zones can be designed to allow for pedestrian level crossing of SBL. Bike parking can be built into the SBL design. Even motorcycle and moped parking can be incorporated. Downtown Calgary streets are already well situated for SBL with sufficient off-street parking for cars and lack of street facing retailing. On-street parking is not required nor should not be encouraged. In fact, SBL may encourage more street retailing. 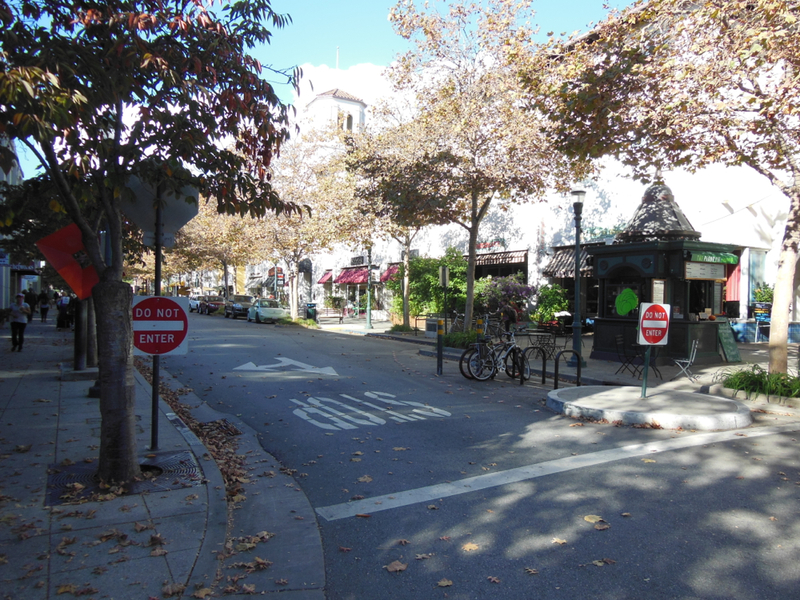 Any change on a street that affects on-street parking tends to be a rallying point for retail businesses to call on city politicians to do nothing. 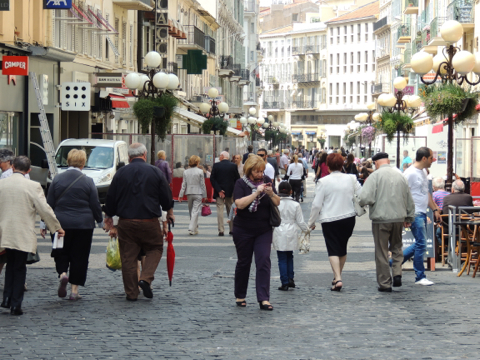 The reality of retail marketing, as one vice-president of a major Canadian property company once stated to a municipal council, is that retail businesses need people traffic. 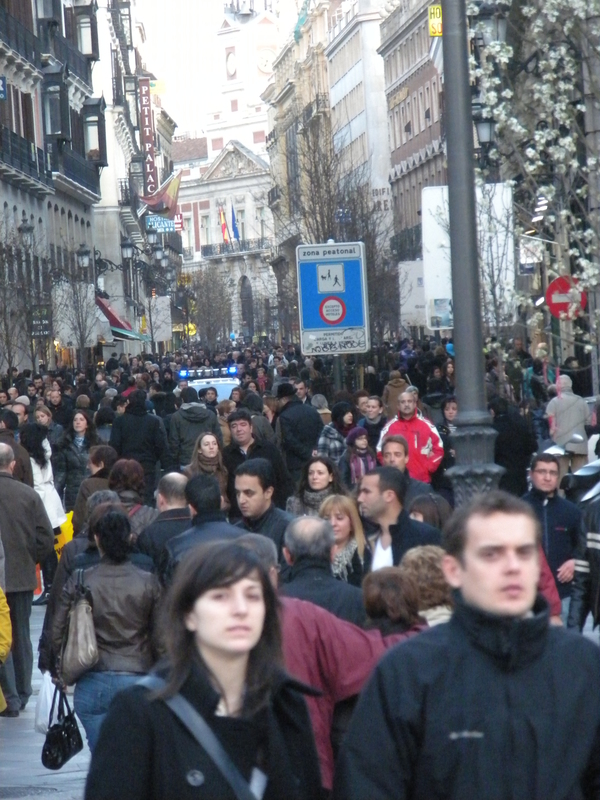 People traffic is critical for retailing success. The source of the people traffic is not that important. 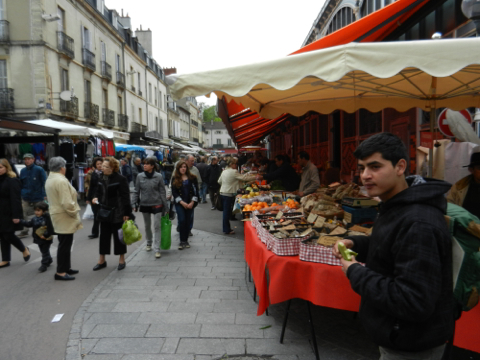 Bringing cycling to a street increases retailing traffic. One car parking spot can be converted to 10 to 14 bicycle parking. About 80 to 100 bicycles can be parked along one side of 100 metre street block that could only accommodate up to 10 to 13 cars. It is understandable that retailers are very reluctant to let go of the umbilical cord of car parking that is now starting to fail strip malls, which were designed for the car driving customers. The marketing model for retailers must continually change with time along with its customers or these businesses will go bankrupt. The influence of cycling customers and differences in purchasing capacity are now slowly being documented by researchers. Without a car, a person has about $10,000 more available to spend each year. Without a second car, that may be about $5,000. The dialogue should be around how to make that happen by focusing on urban form, cycling, and combined mobility of transit and cycling. If retailers cater their products to cyclists, then a 10-fold increase in street traffic is a potential. 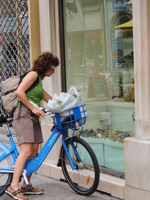 With retailers offering the right product mix, people will cycle to stores. Dialogue would be worthwhile to explore this further. The usual “NO, do not change anything from a car-oriented street” argument is that congestion will increase, meaning car congestion not cycling growth, transit growth, or walking growth, all of which should happen. “Car congestion is good” is an argument used by some people. It is argued that congestion or any other type of roadblock, which could include increased car trip time due to car congestion, more car collisions and negative impacts to personal health, finances, obesity, and health during the aging process, causes people to consider which transportation alternative is in their best interest. For people to make the transition from car transportation to another mode the infrastructure must be there and to a level that is appealing to them to make a change. This includes peak and off-peak transit capacity and service level, combined mobility capacity whether it is car-cycling or transit-cycling supported by cycling infrastructure from home to local rapid transit and high service bus routes, safe and dependable bike parking in all weather, and a cycling network that is appealing from home to final destination including for commuting. Introduction of SBL on a road should be with expectation and target that car traffic will reduce as a result of people make the shift in transportation mode from car-based, not as a facility that is being imposed on top of a car traffic level that will continue to increase in the future. With extensive dialogue, it will be become very apparent that downtown Calgary needs a network of connected SBL’s as another tool for reducing driving into the downtown core and reducing already beyond acceptable and historically high levels of greenhouse pollution. Back in the 1970’s, people wanted to come to Calgary for health reasons since allergies, sinus discomforts and health side effects improved for them. Now these sufferers look for other cities to improve their health: even in January, brown pollution clouds can be seen on Nose Hill, with much contribution from the high level of driving in the city. With carefully thought-out design parameters for SBL and the resulting reduction of driving, the downtown core will become more of a people place after business hours, increase downtown retailing, increase vitality of the city core, and will be more of a place to attract tourists beyond the Stampede. 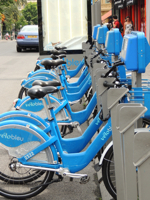 Yes, it is a first phase in the introduction of public bike sharing system, as Paris proved so successfully.